These words by Mr. Sheikhawat remind me of a famous saying “Hard work beats talent when talent doesn’t work hard”. No matter how differently you put them to words, the basic idea of success is emphasized to be Hard work. 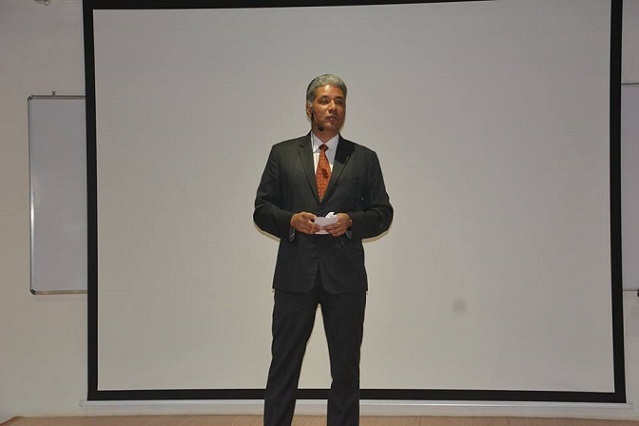 Mr. Samar Singh Sheikhawat, former CMO of United Breweries delivered a guest lecture in IFMR-GSB on the topic “Life and leadership lessons from corporate and sports world”. Mr. Sheikhawat is a highly appreciated professional in his domain and has a plethora of experience in Marketing and sales across industries. He has worked with many British, American and Dutch companies and has vast exposure to leadership throughout his career. On 22nd January Mr. Sheikhawat came to IFMR for a guest lecture and a one to one interactive session with the students. The session was full of energy and the occasional sarcasm and wit of the speaker kept the audience entertained and engaged. The session influenced the students to introspect within and strive for a long term purpose. The basic thoughts shared by the speaker motivated the students to dream for a better future, a future which is promising (and we suppose it to be) and will hold value for us if we have the courage to work for it from today. The speaker emphasized on the role of planning, stating that “Failing to plan is planning to fail”, he further commented that our focus should be to beat our own self and not others, our motive should be to be better than what we were yesterday and thus we should lead ourselves to a better self rather than competing with each other. Take up a role and master it to the core, challenge yourself for continuous improvement. Ending on a note of motivation and encouragement, Mr. Sheikhawat gave life lessons to the curious and bright minds of IFMR-GSB. He further came for another round of one to one interaction with the students, he addressed the doubts and curiosities of the audience and further advised individually to adopt a course of action which enhances and nurtures the abilities and capacities of a person. Performance, And Not Designation, Proves Our Worth, Says Mr Ankur Chaturvedi, Senior General Manager – Operations And Safety, Emami Ltd.